In a small bowl, combine salt, pepper, chili powder, paprika, garlic powder and the zest of 2 limes. Sprinkle ribs evenly with rub. Wrap each slab in foil and place on a baking sheet. In a small bowl, combine barbecue sauce, the zest of 1 lime and the juice of 1 lime. Refrigerate. Bake ribs until very tender, 2 hours for baby back ribs or 3 hours for spareribs. Let ribs cool completely, then cut into 4 portions. Once cooled, ribs can be grilled immediately or rewrapped in foil and chilled. Heat grill to medium-high heat. Grill ribs, basting with half of the barbecue sauce and turning frequently, until sauce has become caramelized and ribs are heated through, about 10 minutes. Meanwhile, melt butter in a large skillet over medium-high heat. Add corn and bell pepper and sauté until crisp-tender. Add green onion and cook until slightly softened. Season to taste with salt and pepper, remove from heat. 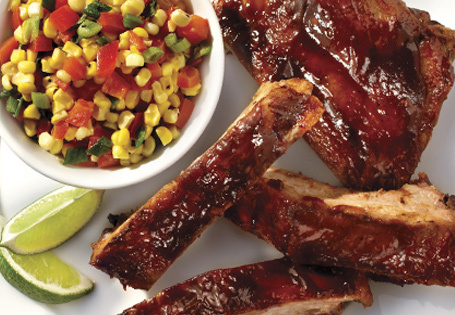 Serve ribs with corn relish and remaining barbecue sauce. *These are Seasonal items that are only in stores for a limited time and may no longer be available.